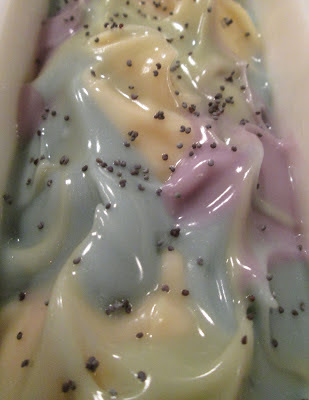 To make the yellow pieces, I poured the yellow soap in a round mold and then put a straw in the middle, which I then removed once the soap was set and refilled with black soap. 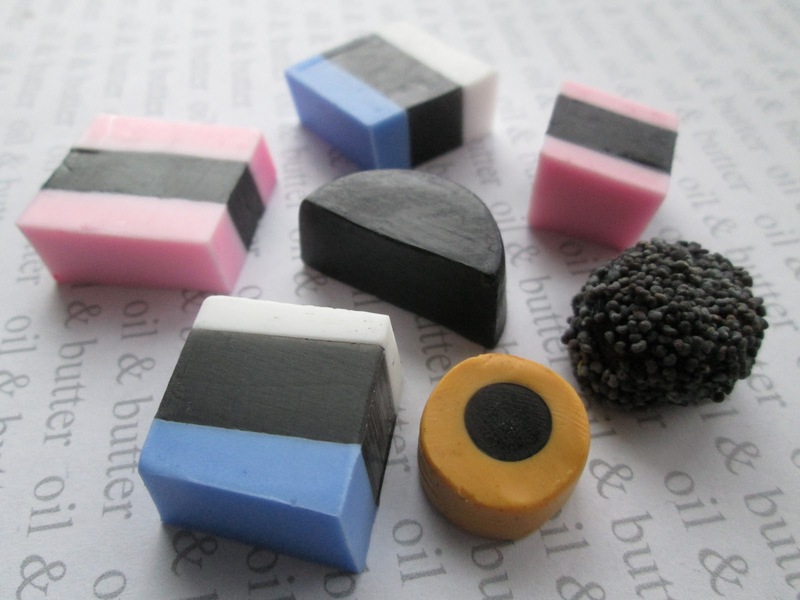 The 'nubby' candy was made by dipping the soap piece in black soap and then rolling it in poppy seeds. It did take a bit of time to make all the pieces, but I think it really adds to the details! Here is the finished soap with the licorice pieces. It smells just like black licorice...yum! And one final picture....remember last Sunday, I mentioned I thought the Coffee Soap needed a little something more? 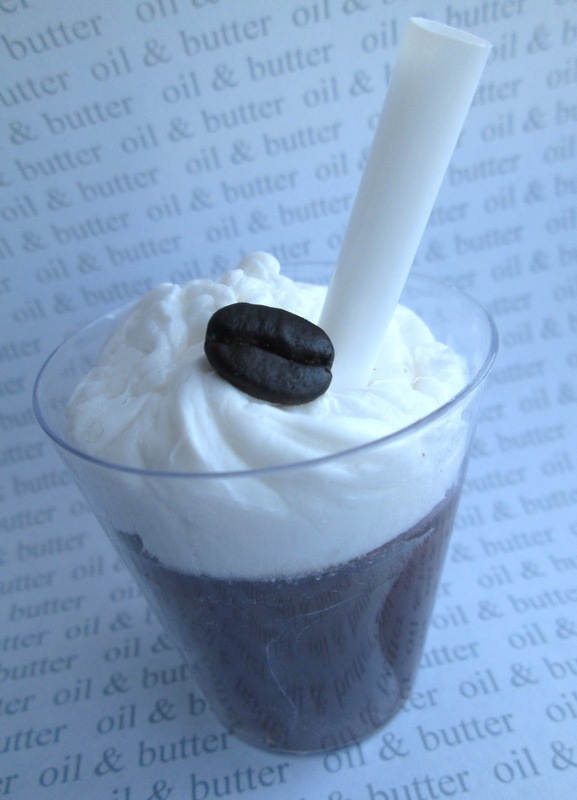 Well, I ended up just adding a little coffee bean to the top; but, now you would know without even picking up the soap, that it was a coffee-fragranced soap! Amazing work. I am in love with the colors and design on the Blackberry Sage Tea. So nice! Thank you so much Holly, I really appreciate it! The blackerry sage tea soap is beautiful Cee! I love how it looks so creamy and just spooning it in worked! May have to try this FO myself! My grandchildren would love the licorice soaps and the coffee bean is just the right touch on the coffee soap! I think you would really like the BST fragrance Gloria! Hope you get a chance to try the licorice too for your grandkids! Thanks Vivien...you were brave starting with a floral fragrance! Thank you Tracy, it seems like a few of us started with OMH! Ginger Papaya sounds so nice too! Thanks for the inspiration Cee. I never think to use things in my kitchen to add to my soaps but now that you've mentioned poppy seeds, I'll have to look around my kitchen to see how to add some oomph to my soaps. And the coffee bean is the perfect topping. I really love the colors and design of Blackberry Sage Tea! I remember my first fragrance - Oatmeal, Milk and Honey. After that was a Jasmine and White Tea fragrance, and I still really love both of those fragrances to this day. 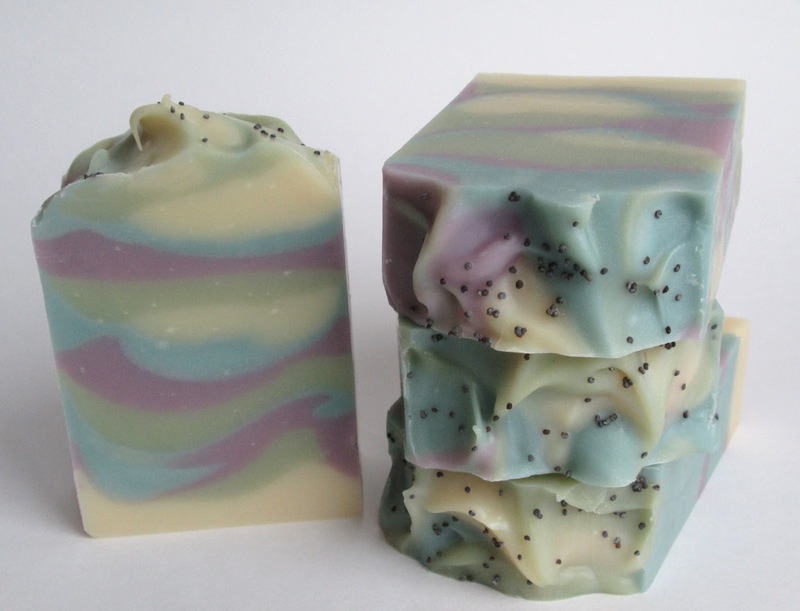 Beautiful soaps, as always! Thanks so much Chrissy! OMH was a good one to start out with, it behaves well and there wasn't too many surprises with it :) The Jasmine and White Tea combo would be lovely too! 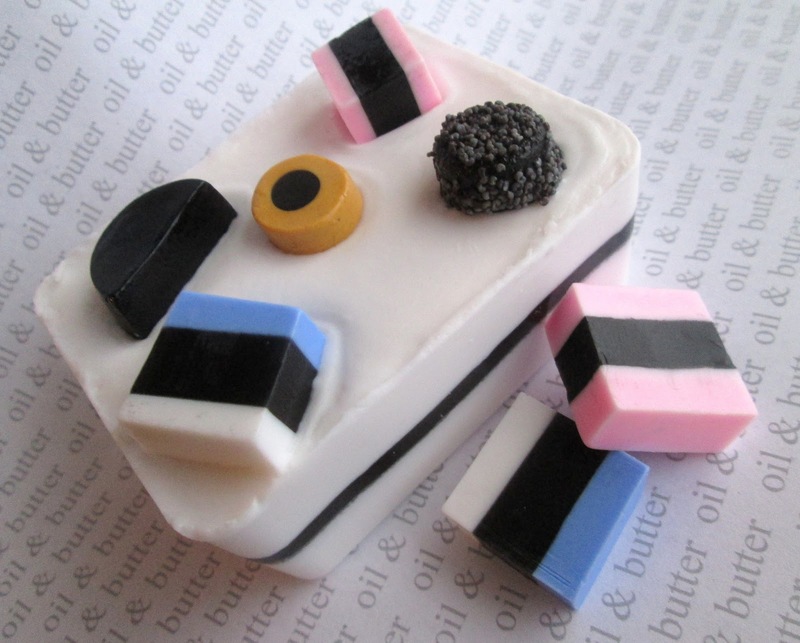 The liquorice soap is so fun! And Blackberry Sage Tea is delicate. Love them both. I had no idea what FO I first soaped with. I had to check that it was Dark Chocolate and some Vanilla FO I got a headache from. 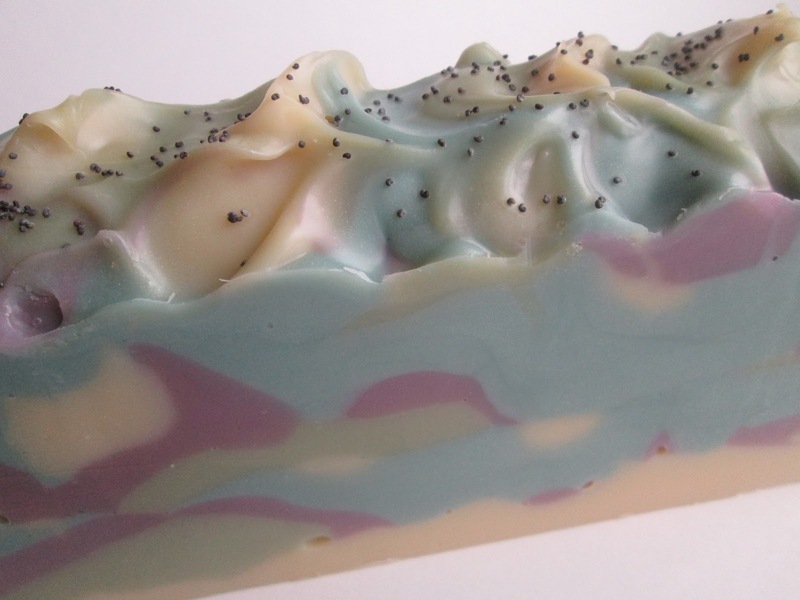 But I do remember that my first soap with a scent was a soap with Peppermint EO. Thanks so much Marika! Did you keep a journal or notebook of your early soaps? I love reading back into my old notes, I've learned so much since my first batch! I love peppermint EO - it's so invigorating, and so nice on it's own or blended. Yes, I have a notebook with my first soaps. I wrote the recipe (of course), when I made the soap, how it looks, feels and how the lather is, how the EO or FO behaved. Cee, you are killing me with your 1st soap, the top is gorgeous!And the licorice candy soaps are so perfect, congratulations! Wish you a lovely week, Cee! Thank you so much Nat, I hope you have a great week too! Your soap looks so creamy and smooth. Really great. Whether this is due to the mango butter? To make soap in the form of licorice I had before but you were faster. And you do that great. I'm very excited. Thank Doreen, it might be due to the mango butter...or the cream? Hope you have a great week! Unos colores maravillosos, los ingredientes igual de buenos, y el jabón se ve muy cremoso. I like the smaller bar too, I'll keep my eyes open and if I run across any narrow and tall molds, I'll let you know! Wow, Cee Gee, the Blackberry Sage Tea is just gorgeous! I love those pastel colors. And the Allsorts are so cute, and the coffee bean is the perfect touch on your coffee soap. My first fragrance was a Rosemary Mint FO that I used in a batch of uncolored soap made with just three oils. It was a very plain soap and the FO faded, but I was so proud of that first batch! That was just over two years ago. Wow Jenny, it's hard to believe you've only been soaping 2 years, I bet that time has flown by! I haven't tried Rosemary Mint, but I've heard it's a really nice combo! Will you get bored with so many compliments here? Sorry of you will,but I need to tell how gorgeous is the first one and how cute is licorice one! So creative,bravo Cee! And I really feel like coffee now! They're all so nice, CeeGee! The blackberry sage tea looks SO soft and creamy and the Allsort soaps must have been fun to do. You're so creative!!! I honestly don't remember my first fragrance--OMH or Lettuce I'd have to guess, but Blackberry Sage was within the first half-dozen or so I tried....I don't know why I haven't done it since? Spectacular! Blackberry Sage Tea has the softest color combination I’ve ever seen! The licorice treats really look like the real deal. 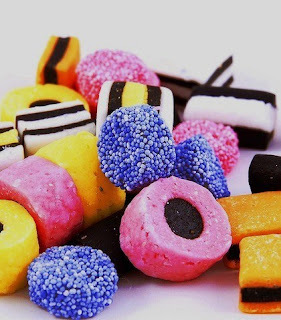 And here in the Netherlands, I saw all the possible and impossible varieties of licorice sweets, they are the world's biggest consumers of this candy. Thanks Ksenija! I did not know the Netherlands had so many licorice fans! My favorite is chocolate-dipped red licorice, yummy!